It saddens me that I must once again discuss the threat of active shooter situations in our workplaces, schools, and even residences. An FBI report shows that there were more active shooter attacks in 2014-2015 than in any other two year period since 2000. As if we needed the FBI to tell us that. Every few months, we hear new reports of death and destruction. In 2001, terrorists targeted our landmarks and government institutions. Today, these animals are only concerned with elevating the body count, which means that any place where there are large numbers of people is a target. No one expects to be shot at when they go into work or when they head out to a club, but the truth is that we must be prepared for the very real danger we might face any moment, anywhere. New York is setting a good example when it comes to active shooter preparedness. In 2004, the City updated its fire code to require that office buildings prepare an Emergency Action Plan (EAP) for “the orderly evacuation of occupants from any office building” in the event of any sort of emergency. Their catch-all definition of an emergency was updated last year when the FDNY incorporated active shooter preparedness into their regular fire safety and EAP presentations. I applaud the fire department for its efforts, but it’s not enough. The FDNY are experts in fire safety, but an active shooter is not a fire. An active shooter may be a former employee, a disgruntled coworker, or an Islamic extremist, and the methods for surviving such an attack are not the same as fire safety. It is imperative that active shooter training be given its own presentation. It cannot get glossed over in the middle of standard fire and evacuation instructions. The FDNY’s official study materials for the EAP Director qualifying exam say that their information on best practices for active shooter situations comes from the NYPD. If so, then law enforcement officers should be in charge of training the public. Why not go directly to the source? No amount of book learning will make an EAP Director as knowledgeable as a police officer who has actually faced violent criminals in the field. 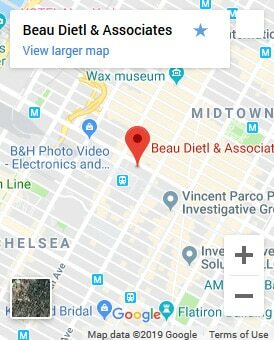 When my security and investigations company, Beau Dietl & Associates, performs an active shooter training for our clients, our presenters are former law enforcement officers, many of whom served in the NYPD Emergency Services Unit, with years of training and firsthand experience in handling deadly confrontations. When it comes to life and death, getting your training directly from these experts can greatly increase your chances of survival. Having a separate active shooter preparedness training in your workplace does not need to be a large disruption in business. 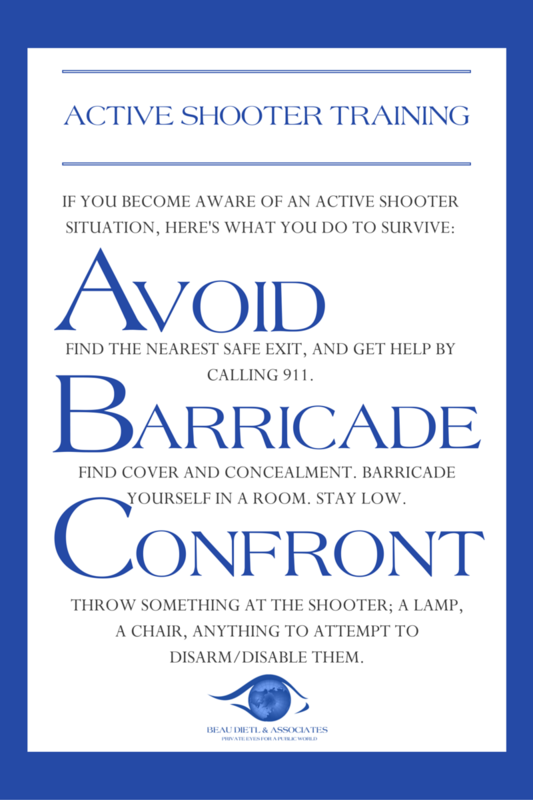 The key to surviving an active shooter situation is as simple as ABC: Avoid, Barricade, Confront. While the FDNY’s description of the EAP which I quoted above focuses on evacuation, flight is not always an option. If you can’t avoid the shooter, you need to know how to barricade yourself in a safe place or, as a last resort, confront your attacker. These ABCs don’t take long to learn. 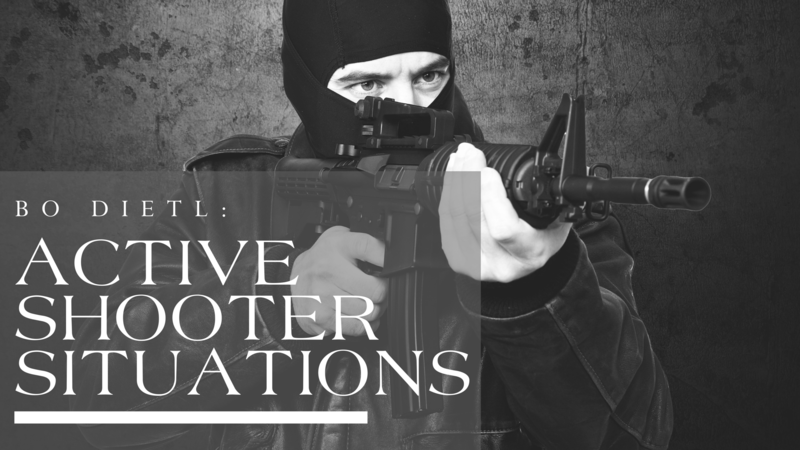 My experts can give a detailed presentation on the best practices for surviving an active shooter situation not just in the workplace but also in train stations, open spaces, or anywhere else in just 15 minutes. Losing 15 minutes of productivity is a small price to pay to save the rest of your life. We live in a new and terrifying world. Hostage negotiation is a thing of the past because the monsters that walk into office buildings and nightclubs and shoot innocent people don’t have demands to be met. They cannot be talked down because whatever belief is motivating them to perform these heinous acts is beyond all reason. In the moments between when the shooting starts and when the first responders arrive, it is up to each one of us personally to know how to make it out alive. Business owners have a duty to their employees to keep them safe. When the threat is fire, you trust the experts in the fire department, but when the threat is a maniac with a gun, you need to trust the law enforcement experts who have faced down such criminals in real life.